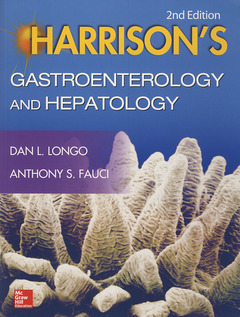 Featuring a superb compilation of chapters related to gastroenterology that appear in Harrison’s Principles of Internal Medicine, Eighteenth Edition, this concise, full-color clinical companion delivers the latest knowledge in the field backed by the scientific rigor and authority that have defined Harrison’s. You will find content from renowned editors and contributors in a carry-anywhere presentation that is ideal for the classroom, clinic, ward, or exam/certification preparation. Features: Complete coverage of must-know gastroenterology and hepatology topics, including cardinal manifestations of disease, differential diagnosis and diagnostic evaluation, management of diseases and disorders, obesity, nutrition, and eating disorders. Reflects the most current advances in genetics, cell biology, pathophysiology, and treatment Integration of pathophysiology with clinical management.